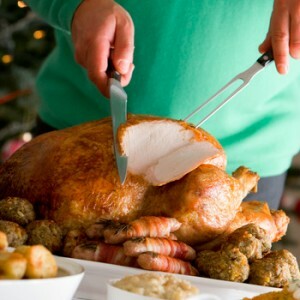 For many of us the holiday season means more parties, more family meals and sometimes, a lot of extra calories. According to surveys, the average American gains just under a pound between Thanksgiving and New Years. This may not sound like much, but the not-so-good news is that this one pound usually stays on through the winter and accumulates year after year. You might be tempted to opt for the wrong “comfort foods” to help relieve stress of family, entertaining, and just trying to get everything done during this busy season. The good news? You can make this year different! With a few simple food tips and tricks, you can celebrate the season without adding to your waistline. #1 – Never go to a party hungry. A healthy energy bar (try making your own with this recipe)– these are also great to have on hand for those “marathon holiday shopping” trips. # 2 – Beware of beverages! It’s easy to forget that many holiday beverages are high in calories. Can you guess how many calories are in one 12 oz. glass of eggnog? About 340! It would take more than 2 hours of brisk walking to burn off those calories. Another common holiday beverage to watch out for is hot chocolate made with whole milk (about 290 calories per 12 ounces). Instead opt for lighter alternatives, consider a skim latte (about 120 calories) or a small glass of white wine (about 80 calories). And stay hydrated throughout the day! Thirst is often mistaken for hunger — so stay hydrated with water and other low calorie beverages. #3 – At a party stay with the talkers instead of the eaters. Eating is contagious and it is very easy to loose track of how many calories are in those little party appetizers. If you you are going to have something from the appetizer tray, opt for the vegetable crudite or a small portion of healthy chips with low fat dip. Another good appetizer option is cold shrimp with cocktail sauce. Choose no more than 2-3 small appetizers; put them on your plate and then walk away from the table and engage in conversation. Stick with the talkers and not the eaters! #4 – At holiday feasts: Moderation should be your guide. Here are a few simple tips to keep from overindulging at the main meal: First, don’t starve yourself all day, waiting for the holiday feast. Have regular meals and snacks earlier in the day. Second, when you get to the table load your plate with veggies: not only do you get loads of vitamins and minerals in few calories, their fiber and water content will help you feel fuller. Keep meat portion sizes between 4 and 8 oz . Finally, don’t drench your potatoes and other side dishes in butter. A light margarine spread made with healthy plant oils will add flavor and save you calories and artery-clogging saturated fat. #5 – Wear something fitted and fabulous. You’re less apt to overeat when you’re feeling great about how you look (and conscientious of how snug your clothes are fitting). #6 – Keep your fitness routine going! The holidays are a great time to stick with your fitness routine — or to start one if you haven’t been working out. Exercise will give you the extra energy you need for parties and shopping. It’s also a great way to deal with holiday stress in a healthy way. If you haven’t been physically active at all, always be sure to check with your doctor before starting a new fitness routine. Great tips! A few I had not thought of before! Thanks so much.